January 1970 The modern research paradigm is far more inclined to collaboration: Interinstitutional research projects are increasingly common. However, the rise in interinstitutional collaboration presents challenges for research managers and government bodies. For example, how can you best track involvement in a multi-institutional projects or showcase community assets and expertise? And how can a cluster of closely linked institutions report on the total impact of the groups’ work and the impact of granted funds? 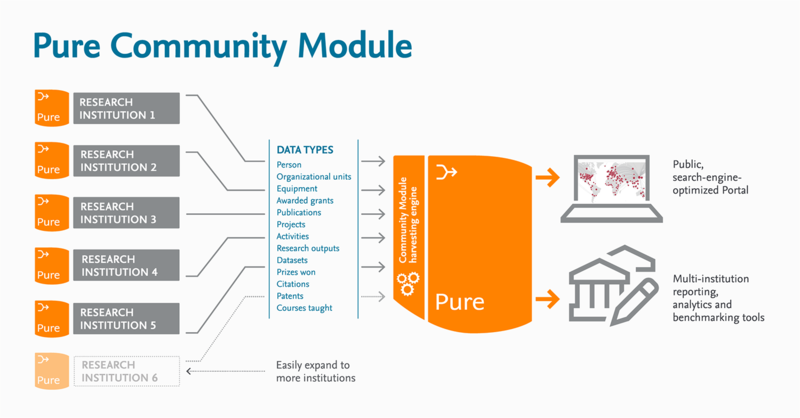 The Pure Community Module facilitates the management of multi-institutional research projects, including data collation, analytics, reporting and showcasing. It provides a shared reporting engine and a multi-institution portal that makes it easy to collate and aggregate the data, showcase the research assets and even understand the contributions of each institution. Whether your Pure Community group consists of the institutions within a geographic region, an academic consortium, or a collective focused on a theme, this is the solution that helps to overcome the challenges in research and information management. Each university in a Pure Community group can continue to run their own Pure instance, which enables them to work with data beyond what is shared with the community as well as do local analytics and reporting. There are also optional university-specific portals for individual showcasing of research. The standardization of data ensures ease of aggregation into the shared Pure instance. There, it becomes straightforward to aggregate the data, run analyses, and generate reports. The Community Portal offers configuration options including the possibility to include custom branding, allowing each Pure Community group to present their desired face to the world. What makes the Pure Community Module unique? How can the Pure Community Module be used? Use the Pure Community Portal as your user-friendly, searchable showcasing website. The Pure Community Portal features the researchers in your group, shining a spotlight on their expertise. It helps foster partnerships between a community of research institutions and businesses to increase collaboration stimulate economic growth and promote innovation. User the reporting engine for inter-institutional reporting and benchmarking. With the clarity delivered by the Pure Community Module, the full group membership can easily understand the contributions to collaborative research projects and their impact. Benchmarking tools further support strategic decisions at the institutional and group levels.